I guess we will get more clarity in the next few days/weeks. 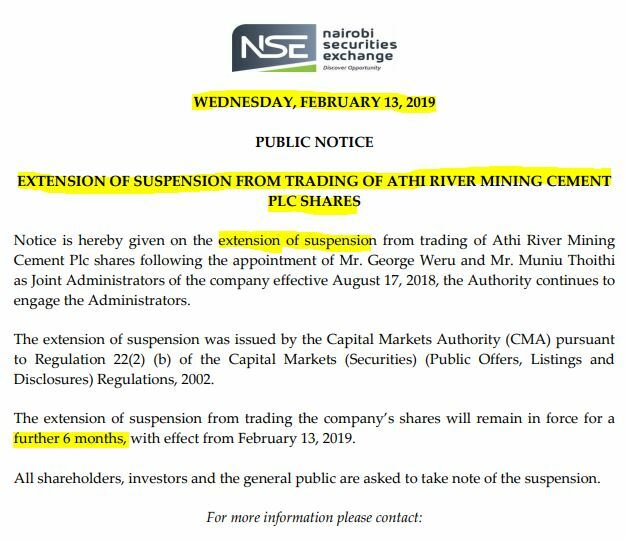 Hope it comes good for the private investors who bought ARM shares in good faith on the NSE. Hatutaki "Open Offer" kwa ARM. If we (shareholders) are going to get nothing then it's better to know now than later. Close the books. I am not counting on getting anything so anything I get is a 100% bonus/profit! When is re-listing due? What about the suitors/bidders what price has been offered? Githeri media anyone? This one we wrote off and moved on kabsaaaaa. Huku Mombasani Rhino 32.5 is retailing and is being bought and used for works...sijui huko mlipo? This one is gone, we moved on. Firms interested in buying out troubled ARM Cement have until the end of this month to make final offers to the company’s administrators PricewaterhouseCoopers (PwC). A new report sent by the administrators to ARM’s creditors has provided additional information on the status of the plans to sell the Nairobi Securities Exchange-listed firm to a strategic investor. “The deadline for submission of binding offers is February 28, 2019,” PwC said in the report seen by Business Daily. PwC says 25 companies expressed their interest in taking over ARM, with 23 of these firms signing non-disclosure agreements which allowed them to receive additional information about the cement manufacturer. “Further to the above, in mid-December, we received a total of fourteen (14) non-binding offers (NBOs) from various interested parties,” PwC said. Ahead of making binding offers, the shortlisted potential acquirers are currently interviewing the company’s management teams and visiting its various cement plants. PwC says it cannot offer more detailed information, adding that it is keen on safeguarding the integrity of the transaction process. While the administrators did not name the shortlisted companies, they are believed to include Nigeria’s Dangote Cement and Oman’s Raysut–which went public with its Sh10.2 billion buyout offer. Any info on the bid offers @Pesanane? “The administrators, in consultation with the transaction advisers, extended bids submission deadline for bidders interested in ARM Cement PLC (under Administration) to mid-March following requests by several bidders for more time to allow them to finalise ongoing due diligence and put together binding offers that meet the administrators’ requirements,” Muniu Thoithi, a PwC executive and one of ARM’s administrators, said.